Round 6 of the IKR Championship at Three Sisters Racetrack, Wigan was on 12 October and on the Valley circuit. Samuel qualified second out of the five Honda Cadets (5th overall) and also finished second in heat one (4th overall in all Cadets). In heat 2 he again finished second for the Hondas and third overall. And for the final he finished in second place for the Honda's and fifth overall out of all 14 Cadets as they all race together but are classified by engine. So here he is with his second place trophy! 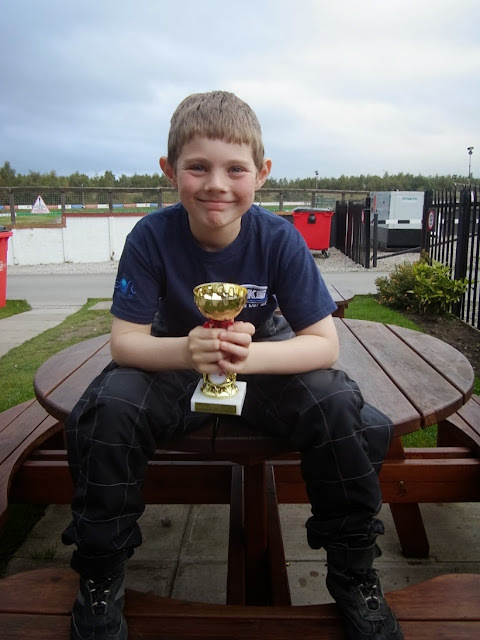 Next race - next Sunday at Hooton - Cheshire Kart Club!